The Nike Air Zoom Elite 8 made its debut earlier this Summer and the new running shoe from Nike is off to a hot start. This latest limited edition is one of the boldest yet! Utilizing a gradient across the entire upper, this upcoming colorway of the Air Zoom Elite 8 starts off with green at the toe and then shifts to blue on the midfoot and eventually red on the heel. If a gradient effect wasn’t enough, Nike decided to add black polka dots all throughout the upper. 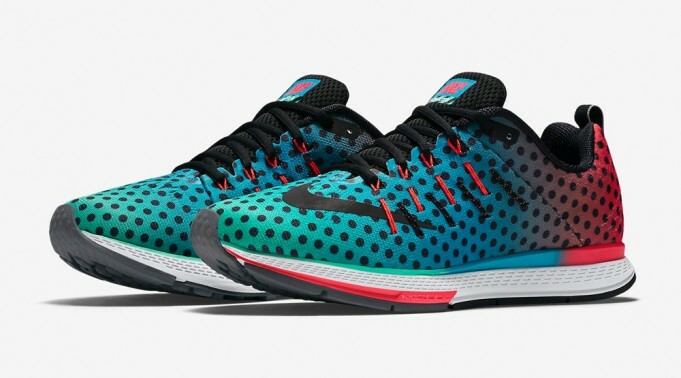 Look for “Polka Dots” of the Nike Air Zoom Elite 8 at Fleet Feet Sports Madison & Sun Prairie beginning Sunday, August 30th. *Extremely limited to stock on hand--We are the only stores in Wisconsin to have this shoe available to sell!